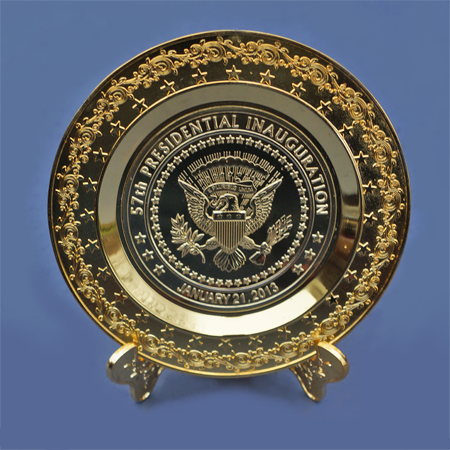 Featuring a large, raised rendering of the Great Seal of the President of the United States, this highly detailed collectible plate encircles the Great Seal with the words "57th PRESIDENTIAL INAUGURATION � JANUARY 21, 2013," and comes with a display stand and gift box Plate and stand are made of metal. Display plate and stand are both gold colored. Plate is for display and decorative purposes only and measures 4.5 inches across.